Discover the pristine waters, beaches, rainforest & the Great Barrier Reef from Port Douglas. See the termite mounds & waterfalls of Litchfield National Park. 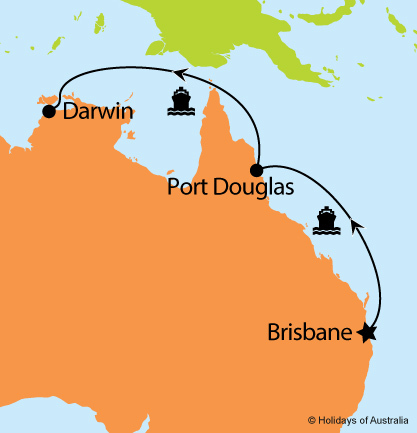 6 nights aboard Pacific Dawn cruising from Brisbane to Darwin with a port call in Port Douglas. Your cruise includes on board meals and entertainment. 2 night stay in Darwin at the DoubleTree by Hilton Esplanade including breakfast. Full day Litchfield National Park & Waterfalls tour. Images courtesy of Peter Eve, Tourism NT, Tourism & Events Queensland & Great Southern Rail.